We’d like to think that there is someone for every pet out there. We can imagine a world when this dream can be made into a reality, and where all animals, even special needs pets, enjoy happy homes. Break out the tissues for this wonderful story of how an abandoned special-needs dog and a woman battling a disability came together. When we first met Wendy Rodriguez we were thrilled to hear her story and share her inspirational journey with you. On the outside her life might seem pretty standard: she is in a happy relationship, has a lovely daughter named Isabella, she works hard and enjoys time with family and friends. Despite her enthusiasm and energy, Wendy was born with Spina Bifida, a developmental congenital disorder. When Wendy was just a baby, the doctors told her mother that she would not live past the age of ten years old. But Wendy’s mom is a strong woman who believed Wendy could preserver. She pushed her daughter to do everything that any kid her age would do despite her disabilities. It was not long before Wendy discovered that she had inherited her mother’s fortitude and faith, and she is now 23 years old. When it came time for her family to get a dog Wendy knew she wanted to adopt and give back, providing a home to an animal in need. So Wendy and her partner Joel started their search on Adopt-a-Pet.com. When Joel first saw a picture of Bentley, a sweet Bulldog mix at Pooch Heaven Rescue, he was immediately drawn to his cute, smushy face. But as he read Bentley’s bio describing his personality and behavior, his jaw dropped. Joel ran over to show Bentley’s profile to Wendy. 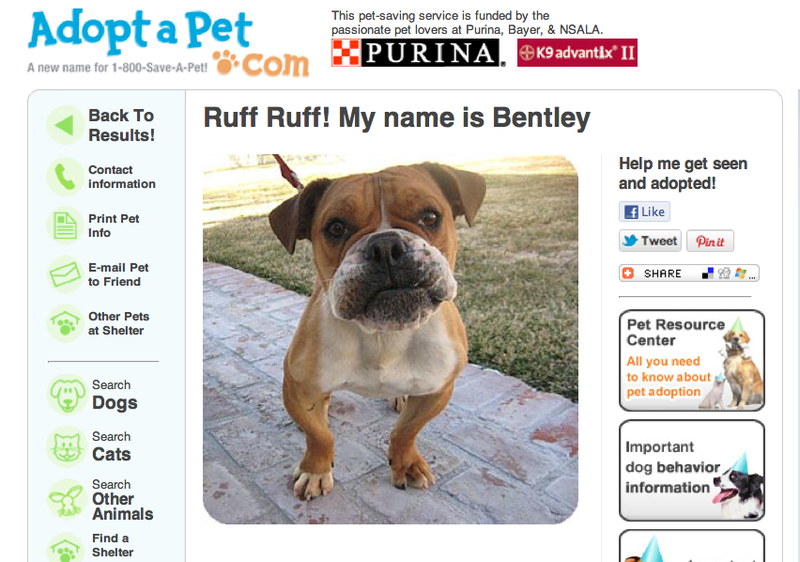 You see Bentley, too, had Spina Bifida. Without a doubt, Wendy and Joel knew that Bentley was meant to be their dog. Out of the many profiles they saw, his was the one that called out to them. Bentley had been passed over time and time again by adopters who did not want to deal with his condition. He waited patiently for just one best friend in the world, and his rescuers hoped his limitations would soon be accepted by a nice family. Their wish came true in Wendy, strong and determined that Bentley was just what her family needed in a pet. Her dedication was as unwavering as her mother’s, and that is just what Bentley would need. As soon as Wendy and her family reached Pooch Heaven’s Rescue Ranch, they met Bentley and fell in love. Their Adopt-a-Pet.com search for a new furry family member had brought them the sweetest, most loving pup they could ask for. Wendy will tell you that she feels her struggles are all worth it in the end. It has made her who she is, and she’s proud of it. What has perhaps surprised her most might be that her and Bentley found one another, two kindred spirits who could help heal each other. In Wendy’s readiness to take care of Bentley, she has found herself taken care of, too. He is the perfect four-legged pal who understands her without words and loves her unconditionally. Together they serve as a bridge between their species, and together they overcome their pasts every day. Wendy gave Bentley the gift every dog deserves: the chance at a forever family who adores him! But adopting Bentley came with a gift in return: Wendy’s family is now complete. Did you like this story? Click an icon below to share it on Facebook, Twitter, and more! Please check out our website if you and your family is interested in adopting a fantastic special needs pet of your own!